The Legacy Of George F. Johnson And The Square Deal On Dec. 1, 1948, the nation witnessed one of the largest funerals in U.S. history, for George F. Johnson. 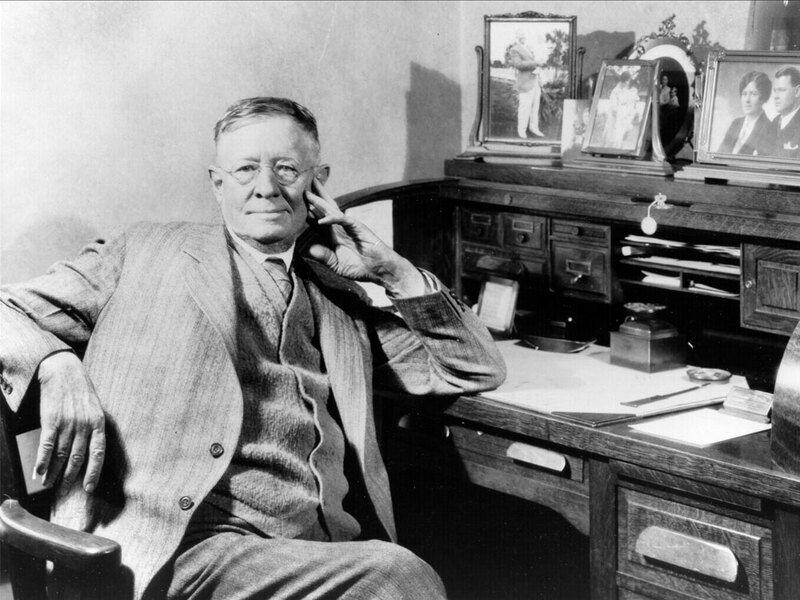 The owner of the Endicott Johnson Corp., at one time the country's leading shoe manufacturer, believed it was his responsibility to provide for workers' welfare. So he created what he called the Square Deal, which one welfare expert says is an anachronism today. George F. Johnson was the owner of the Endicott Johnson Corp. -- at one time the country's leading shoe manufacturer -- and one of the nation's welfare capitalists. Sixty-two years ago, the nation witnessed one of the largest funerals in U.S. history. It marked the passing of not a president, but of a captain of industry. The company was based in the Triple Cities of upstate New York: Endicott, Johnson City and Binghamton. The region was known as the valley of opportunity, so-called because of Johnson's generous labor policies, known as the Square Deal. When Sal Poliziano, who worked for Endicott Johnson for close to 40 years, first came to Endicott in the 1940s, he says he noticed two things. "People are so friendly and they sit on their porches and they're listening to band concerts, and they'd greet me: 'Hello, how you doing son?' " he says. "Everything was camaraderie stuff up here." Poliziano also noticed that everything seemed to revolve around George Johnson. Workers in an Endicott Johnson factory in 1930. Johnson, noted throughout his career for his progressive labor policies, was one of the earliest and largest promoters of welfare capitalism. He believed it was the responsibility of the modern, progressive employer to provide for the workers' welfare, according to Melvyn Dubofsky, a retired professor of history at the State University of New York. So Johnson offered a bargain to his employees. New employees at Endicott Johnson were given a copy of a pamphlet called "An EJ Worker's First Lesson in the Square Deal." 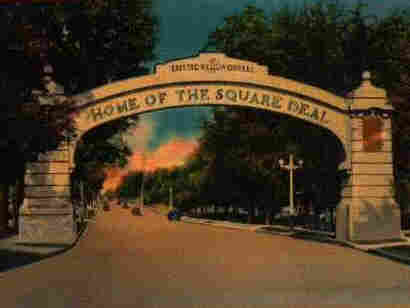 "To the new EJ worker: You have now joined the happy family in the square deal. If you are faithful, loyal, and reliable, you will earn a good living under fair conditions. You are indeed a part of the company. Remember that you are cared for when sick, medical and hospital services are yours, privileges of many kinds are yours. Your friend, George F. Johnson." Dubofsky says Johnson believed that if he provided the employees with what he thought they wanted, they would be loyal and they would show that loyalty. And with less labor turnover, Johnson could outproduce and undersell competitors. It was a good deal for many workers, like Poliziano. He started on a freight gang at Endicott Johnson, and he says that all of a sudden he felt like part of the family: a family that would take care of him. Endicott Johnson provided its employees a staggering number of benefits: shoes for the workers' children; the most extensive medical plan in the country; subsidized housing; playgrounds, parks, a golf course, theater, swimming pools -- and free rides on merry-go-rounds. Sandra Scanlon, Johnson's granddaughter, says that as a boy, her grandfather couldn't afford to ride a merry-go-round. So later in life, Johnson built six carousels in the area, and made sure it was written into local laws that they must be free. And to this day, they are. During the good times, Endicott Johnson would host band concerts in the park on Sunday evenings, according to Gerald Zahavi, who wrote Workers, Managers and Welfare Capitalism. The final song was "Marching Along Together." Endicott Johnson workers and mangers took the song as a sort of anthem, a symbol of the bond they felt between labor and management. This footage from 1931 shows the lavish parades that were thrown in Endicott, N.Y., in honor of George F. Johnson. Workers built floats depicting their factories and paraded through the streets dressed in their uniforms. There was, however, an opposite side of the coin. Bob Johnston lived in the Triple Cities for 50 years and was a union organizer in the region. He believed that all of the benefits that Endicott Johnson provided were a way to make people feel as though they had to be grateful to the Johnson family. And he says he felt that this was wrong. "Workers worked hard," he says. "We shouldn't have to be grateful to somebody for whom we work, for whom we're making money." It was hard work, especially in the tanneries. Scanlon remembers going into the tannery with her grandfather. She says the factory was full of huge vats of acid that stripped the hair off the hides. Men with huge wooden paddles and arms like fighters were stirring them. "The stench was horrible. I held my nose," Scanlon recalls. "And [my grandfather] turned around and saw me: 'Young lady, you take your fingers right down from your nose. That's your bread and butter.' "
But in the 1930s, during the Great Depression, the company fell on hard times and had to cut wages. Work went down to just a couple of days a week; sometimes workers brought home paychecks for less than a dollar. One day, Johnson came into the factory to make a speech, according to former worker Earl Birdsall. Birdsall recounts Johnson saying: "My friends, times are rough. But I'm gonna tell you one thing. We're not gonna lay nobody off. We're all gonna work, take what little we got and share. There are lots of dandelions on the hills and fish in the rivers so we'll have to live on that." But at the end of the 1930s, the company was threatened with a union organizing committee, and the workers went on strike. Johnson went to try to talk to them. "We was out there in the street fighting for more money," says former worker Elmer Knowles. "And he went down and he parked his car in the parking lot and he tried to talk to us on the loudspeaker. And I'll never forget there was tears in his eyes. He drove away in tears." And he went down and he parked his car in the parking lot and he tried to talk to us on the loudspeaker. And I'll never forget there was tears in his eyes. He drove away in tears. Johnson was passionately anti-union. He tried to ferret out union organizers from the company, alleging they were subversives, says Dubofsky. And according to author Zahavi, Johnson employed private detectives to spy on his own workers to find out what conversations were going on in local taverns and bars behind his back. Eventually a vote was scheduled for early January 1940. More than 15,000 workers had a choice of voting for or against unionizing. Another worker, Thomas Chubbock, remembers that everyone went to the polls with full intentions to vote the union in, and instead went in and voted them out. When push came to shove, 80 percent of the workers voted against the union. 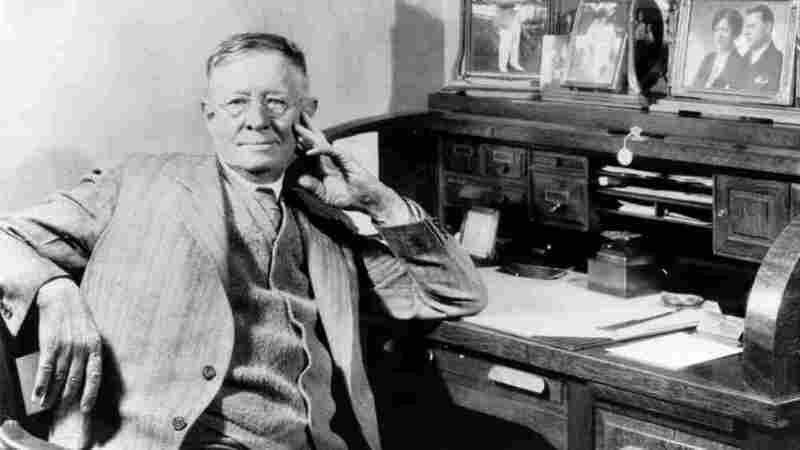 Endicott Johnson had managed to preserve enough of the Square Deal to hold on to the workers' loyalty. "When the remainder of the country was boiling over at the end of the 1930s with strikes, riots, labor violence, Johnson could proudly say, 'It doesn't happen here,' " says Dubofsky. In the 1940s, Endicott Johnson grew dramatically. 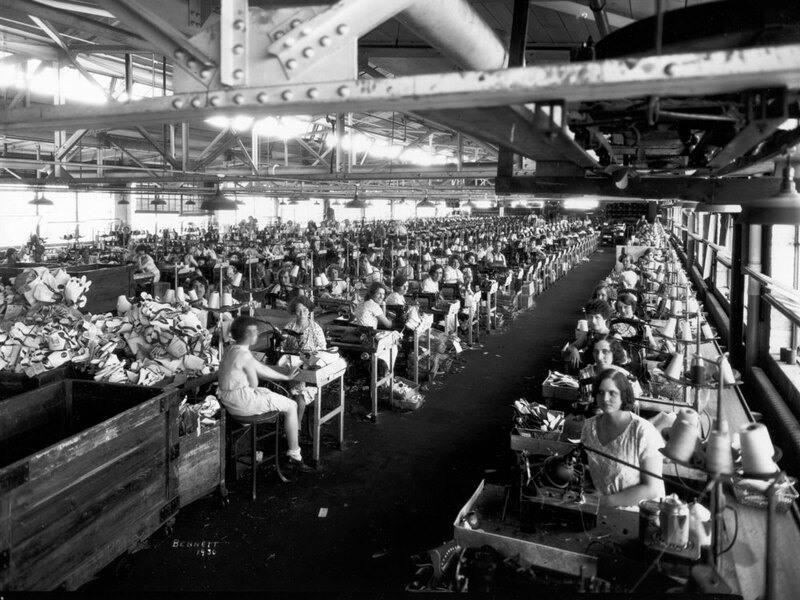 The company was one of the largest providers of shoes to the U.S. military during World War II, and at its peak it employed about 24,000 workers. But as the economic health of the company was improving, the health of its patriarch was deteriorating. Johnson died Nov. 29, 1948, in Endicott. The funeral on Dec. 1 was held at the local stadium. Scanlon remembers that the place was packed with thousands and thousands of people, but it was quiet enough to hear a pin drop. After Johnson died, the company went into decline. It had trouble competing with foreign imports. By the end of the 20th century, 70 percent of shoe production was in China. Poliziano says the company tried to adjust. "All of a sudden, they were bringing in this vice president and this new president," Poliziano remembers. "You know, 'We're not making any money on that, let's shut that department.' And then you got people saying, 'Now wait a minute, it wasn't like that when George F. was here.' "
Zahavi says the Square Deal is an anachronism today. "Now this company is cutting back, that company has failed, this company is moving abroad," he says. "I don't think that workers expect very much from corporations today." In 1995, Endicott Johnson was bought by U.S. Industries and its operations moved to Tennessee. Five years later, it was sold to Citicorp Venture Capital. It's now a subsidiary of Rocky Brands, based in Ohio. Poliziano still lives in the community where he put in 40 years at Endicott Johnson. Nearly his entire family worked for the company: his father-in-law, sister, uncles, aunts and all of his children. But, he says, things have changed. "I notice the merry-go-round is still there. But nobody uses it," he says. "As I go by I just see it going around and around and around. Like something of the past." Still, Poliziano and his friends gather to sing the old Endicott Johnson song -- and remember the old times. Produced by Joe Richman and Samara Freemark of Radio Diaries, and Jon Miller, with help from Ben Shapiro. Edited by Deborah George.